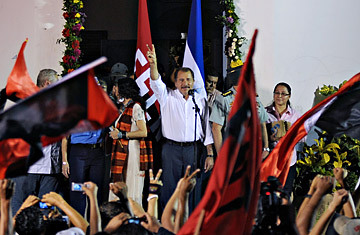 Nicaraguan President Daniel Ortega, center, gives the V sign during the anniversary of the birthday of revolutionary hero Augusto Cesar Sandino in Niquinohomo on May 18, 2010. Nicaragua's President Daniel Ortega may be the most divisive figure in Nicaragua's recent history, but since his unexpected return to power in 2007, he has promised reconciliation. To that end, he has surrounded himself with a motley crew of former political and religious adversaries who now pledge allegiance to his government. But despite the rhetoric of rapprochement, the aging revolutionary's obsession with maintaining his own power has pushed the country back towards violent polarization. Still, one group of Nicaraguans that Ortega may have successfully united, albeit unintentionally, are former combatants from both sides of the civil war of the 1980s. A group of former Sandinista guerrillas and contra fighters  the militants of the left and the right  have started to find common ground in a country where the political spectrum is more like a circle than a line. United against Ortega's efforts to stifle democracy and sidestep constitutional term limits to get himself reelected in 2011, the unlikely allies are warning that this may be Nicaragua's last chance to find a civil solution to its political problems. "If there is reelection, there will be insurrection," is the new slogan of a recently formed group of Sandinista dissidents, who call themselves the Movement Against Reelection and Fraud. Ex-contra leaders are also warning that things could get dicey here if Ortega consolidates a "totalitarian regime." While the constitution prohibits consecutive presidential terms, Supreme Court judges appointed by the Sandinistas last year exempted Ortega from that law. Though Ortega has the lowest approval rating of any president in Latin America, Nicaragua's divided political opposition continues to lose ground to the ruling party's increasingly audacious offensive against the country's weak constitutional democracy. That situation has compelled ex-Sandinista and contra militants to come out of the political shadows and take matters into their own hands. Sandinista guerrilla hero Henry "Modesto" Ruiz, perhaps the most hard-line, Moscow-educated communist among the nine comandantes who ran the first Sandinista government, says those who fought in Nicaragua's civil war are the ones most determined to prevent a return to violence now. But he warns that time to act is running out. "The true contra leaders are saying the same thing, so we have started to agree. I tell you that as a man who is not nostalgic; there is a problem and we need to fix it because we can't continue living like this," Ruiz said. "This government is more despotic and tyrannical than it is revolutionary." The leaders of the contra resistance, which last month celebrated the 20th anniversary of their disarmament, are also starting to reemerge from obscurity. "We will not allow another criminal and genocidal Sandinista dictatorship like the one the Nicaraguan people lived under in the 1980s. A Sandinista triumph in the 2011 elections would be a catastrophe and tragedy for Nicaragua and the people of Central America," reads a June 27 communique from the FDN-RN, a group in Matagalpa that claims to the "real contras." But, like the Sandinistas, the former contras are also split on Ortega. Many of those who have received government aid are now allied with the president, while others, including one small band that is already calling for a return to arms, oppose the government. Most contras are calling for peaceful resistance and say violence is a last resort. "Military action is not viable at this moment," former contra commander Luis "Comandante Jhonson" Fley told TIME. "But if Ortega gets reelected, the strategy changes. We can't allow that to happen." Fley says the position of the contras has always been to defend democracy. He insists the Sandinistas who oppose Ortega are the ones who have changed sides. Ortega's supporters agree. They call the Sandinista dissidents "traitors" and "false Sandinistas." "Those who are not in the Sandinista Front are not Sandinistas. Those who do not support the programs of this government are not Sandinistas. And those who go around with the counterrevolutionaries are not Sandinistas," said Sandinista rebel hero-turned-contra Eden "Comandante Cero" Pastora, who had ironically broken from the revolutionary government in the 1980s to lead his own insurgency in the southern jungles. Pastora finally reconciled with Ortega in 2008. But the dissidents claim it is Ortega who is the "false Sandinista", having created a regime they charge is more like the Somoza dictatorship than the movement that toppled it in 1979. "Ortega is playing the same role that [former dictator Anastasio] Somoza did," said former Sandinista official Moises Hassan, a member of the revolutionary junta in the 1980s. "With Ortega, there is no more revolution. His goal is to consolidate power and create a family dynasty." And like Somoza, Hassan said, Ortega is unintentionally unifying Nicaragua's diverse opposition against him. "The unifying factor in Nicaragua is called Daniel Ortega," he said. The dissidents of left and right have not merged their separate measures against the president, but they may be hoping that Ortega will, in fact, succeed in his efforts at reconciliation and national unity  but only around the common goal of achieving his downfall.